I work at Longhill High School, a large secondary comprehensive school in Brighton, where I’m head of Modern Foreign Languages. We have had a monthly LGBT+ student meet up for about the past six months, which we started in order to support and provide students who were coming out with a safe space. Recently at a student’s request we changed this to a weekly club and named it proudlonghill. The club has 25 weekly attendees and I felt that as a school we were making great progress to create a more inclusive environment. However, a few weeks ago, my colleague Luke came to see me and told me a sad story. He had been talking to a student in Year 10 about some other students in the same year who had recently come out as bisexual. The student said he felt that the students that had come out were attention seeking. Luke used the opportunity to educate the student and used his own coming out experience to explain that people do not do it for attention. When Luke told me this, I in turn shared some stories about the homophobic language I’d heard around school recently. He suggested doing an assembly for the Year 10 students, to explain that people don’t come out for attention and that it’s a big step for the individual. I also wanted to make it clear that homophobic language is unacceptable at school. We asked our SLT for permission and they requested that rather than just focusing on Year 10, we deliver assemblies for the whole school. The idea was to ensure that all students received a consistent blanket of information as well as staff. We started on Tuesday and finished on Friday. In the assembly we told the students once and for all that homophobic language would no longer be accepted, that students who come out as LGBT+ are not attention seeking and that they are simply seeking to live authentically. Luke and I both came out, as a gay man and gay woman. I explained a bit about my own coming out process, and talked about the endless coming out process that LGBT+ people go through during their lives, how it’s not just a one-off event, it’s a daily one! We also gave information about the services we provide as a school, and the outside agencies we work with. For example, we partner with a charity called Allsorts, who come into school and meet 1-1 with students who need support on any LGBT+ issues. You can see the video of our final assembly here. The feedback and response has been overwhelming. Students have been more comfortable coming out, telling us their stories and generally expressing huge positivity towards the LGBT+ community as a whole. It’s not just LGBT+ students who have been talking, it’s heterosexual ones too. It’s brought the whole school together. 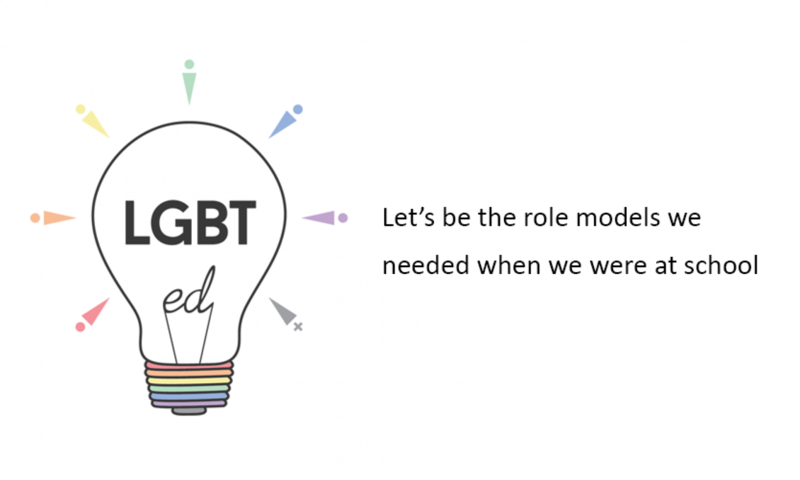 I have been approached personally by several students whose identification as LGBT+ was previously unknown to us, and it was heartening that they felt able to trust me with their story and ask for support. I also had a young student ask me to support her with a friend who continued to use gay as a pejorative and we discussed his behavior with him and why it was unacceptable. We are keen to encourage other schools to do a similar act, to be the role models that their students need. It’s all well and good talking about Drag Race stars, and Ellen, Tom Daley and Laverne Cox, but what our students need are role models they see everyday and know. They need someone that they can talk to and ask questions of – they need real people . ‪I am an openly gay headteacher. I don’t preach about it but my husband works at the same school. The kids ask if we are brothers or worse still, am I his dad! Just correct them and move on. We are open with parents and children and hopefully we are positive role models. We have attracted other gay teachers. When we got had our civil partnership there were parents and children outside the register office cheering us on. That was 12 years ago. The school has done some excellent work with educatecelebrate so there is a real sense of equality for all throughout the school.